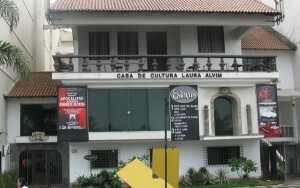 RIO DE JANEIRO – People who think of Casa de Cultura Laura Alvim as just an eccentric cinema are in for a big surprise. After being closed for almost two years worth of structural renovations, the Galaria Laura Alvim is reclaiming it’s place in Rio’s cultural landscape. Aiming high it will focus on the contemporary Brazilian Art movement. This goal shows itself clearly in the plans for 5 new exhibitions, curated by Ligia Canongia, in 2009. Most visitors who stroll down Viera Souto past posto 9 have seen the Cultural Center Laura Alvim; many have made use of one of its screening rooms that remained open during the renovation. Though the largest has only 73 seats, (and the other two 45 & 37) it presents a well thought range of films. A recent schedule balanced this years Oscar winner for best film, Quem Quer Ser Milionario (Slumdog Millionaire) and other Hollywood fare like Milk and Mama Mia with contemporary European films like A Bela Junie and Ninho Vazio. The recently opened gallery can be accessed from the internal courtyard but is also set apart with it’s own entrance, a sweeping marble staircase on the right side of the building takes you up to an airy exhibition space. The natural light that floods Ipanema beach is subdued with diffusing screens; as a result there is no glare, just a soft glow illuminating the artwork. To launch the project renowned Brazilian Artist, and native Carioca, Jose Damasceno is presenting 12 works from his series,”Projeto-objeto” (Design object). Dividing the 120 square meter gallery space into four rooms his hope is to provide the viewer with a tangible space that is, “the union of imagination and thought”. Damasceno’s work has been shown in Madrid, London, New York and Venice. “It is a great honor for me to help inaugurate this new phase of The Galeria Laura Alvim. It is a pleasure to be part of the revitalization of marvelous spaces like this that were not being used,” said Damasceno. These sculptures, photographs and drawings will be on display through the 10th of May, and admission is free. In this and other respects Galaria Laura Alvim is unique. According to Adriana Ratter, the secretary of culture, Galaria Laura Alvim is the only publicly administered space in the state with a clear objective to focus on, develop and reinvent the vocation of contemporary artist here in Rio de Janeiro. Galaria Laura Alvim is at Av Viera Souto 176 (at Teixeira de Melo) Ipanema 21 2332 2016, and you can see the current work on exhibition here .